For every King, there are a thousand contenders for his throne. 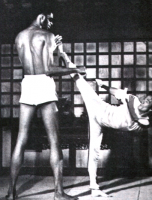 Bruce Lee was constantly under pressure from fighters eager to prove that the world-famous Little Dragon could be slain. On location for Enter the Dragon a young extra constantly taunted Bruce with jibes like 'I don't think you're so fast, it's all trick photography.' As Bruce studiously ignored him the catcalls became more venomous: 'You're a phoney, no one's that fast. I challenge you.' The youngster hopped down off a wall and began dancing around Bruce. Bruce played with him for a moment or two, and then, with astonishing speed, smashed the boy in the mouth with his foot - just hard enough to break the skin, and to prove that the game was over. 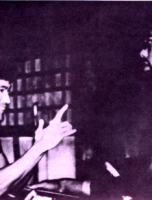 Bruce Lee never doubted his own ability. 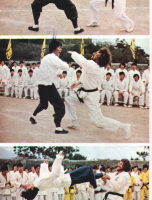 'When I first learned the martial art I too challenged many established instructors, and what I have learned is this: If you are secure within yourself you treat it very, very lightly because you ask yourself "Am I afraid of that man? do I have any doubt within me that he is going to get me?" If I do not have such doubt I treat it very lightly, just as today the rain is going on strong but tomorrow maybe the sun is going to come out again." 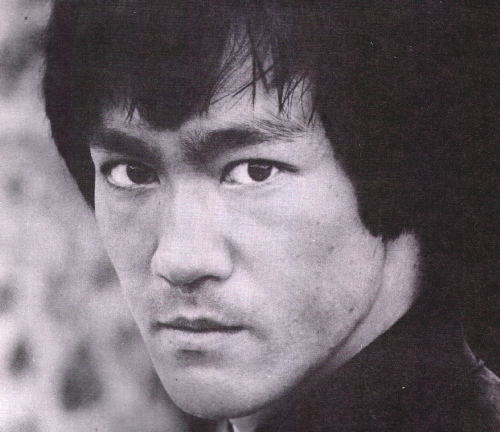 Above all, Bruce Lee's great humanity shines out of these situations. It is perhaps best illustrated by a story from his rough 'n' ready youth. 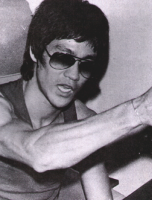 A rival gang leader challenged Bruce to a rooftop battle - 'the winner can toss the loser over,' he said. Bruce agreed, they climbed five storeys to the top of a Kowloon apartment block, and as Bruce was taking off his jacket his opponent kicked him in the face. The Little Dragon speedily and angrily returned the blow, breaking both his opponents arms and fracturing his femur. Then, instead of hurling the boy to a certain death below, he telephoned his relatives who took the youth to hospital.